But how do people really grow? Transformational Discipleship describes the process that brings to life that kind of person described in the Bible. There?s no magic formula or mantra to recite here, but rather a substantive measure of research with churches and individuals who have wholeheartedly answered the call of Jesus to make disciples. And they will grow, not because of human research, but by the power of the Word and of the Holy Spirit working through the church?the same way disciples have always been made. When the people of God engage in the mission of God through the Spirit of God, lives are transformed. 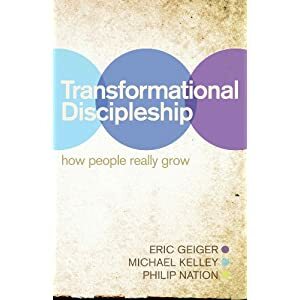 Transformational Discipleship DVD introduces church staff members, church leadership teams, and small groups to the content found in the B&H book "Transformational Discipleship." The DVD supplements this book and provides a discussion guide for participants. It consists of four video sessions, each approximately 30 minutes long. Get a better understanding of Transformational Discipleship and start a conversation with your team about implementing its principles in your church or small group. Congregations have long measured success by "bodies, budget, and buildings" - a certain record of attendance, the offering, and square footage. But the scorecard can't stop there. When it does, the deeper emphases on accountability, discipleship, and spiritual maturity is lost. Ignoring those details, we see fewer lives transformed, Christian influence wane, and churches thin out - a situation that is all too familiar across North America today. The Transformational Church Assessment Tool provides your church with the ability to assess the health of the congregation, celebrate areas of strength, and address areas of concern. It is the linchpin in the Transformational Church initiative. The guidance provided in the book and DVD discussion guide, and the help offered through consulting services, will be most difficult to apply without the ability to understand where your church is and how your congregation perceives what your church is doing. Transformational churches make disciples whose lives are being transformed by the gospel so that the culture around them is ultimately transformed.